- Latest 7 inch Torus Stock has Scandinavian Mill mark : AUN ? Previous Mill marks have been *SCA* // STORA // +JDIA+ // AUN ? Redwood Timber is a natural product - variations in knots, colour and grain should be expected. 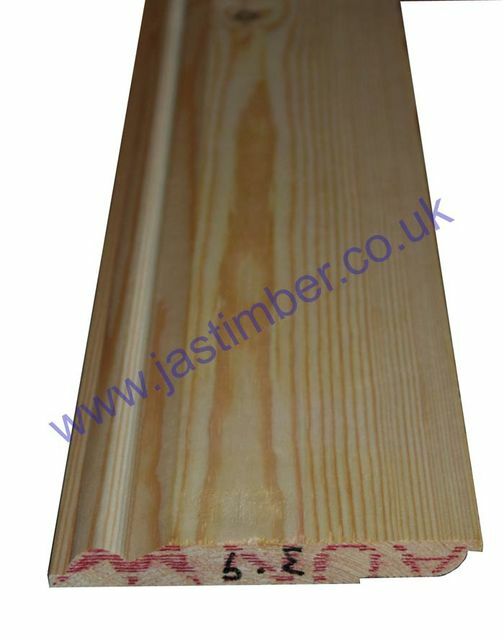 7 inch Planed Timber Skirting should be treated and fixed in place as soon as possible to help minimise any movement/­twisting and surface checking/­splitting that occurs naturally with changes in moisture content; External use as Barge boards etc. is at your own risk - Timber life expectancy is increased with suitable timber treatment and protective finishing coats. It is better to use pressure treated timbers externally. Planed 7" Torus Redwood Skirting sizes are generally ±1mm on thickness / ±2mm on width with one splitter saw edge & ±6mm cross-cutting tolerance although - be aware: For a multitude of reasons, size and profile of timber may vary from batch to batch, so it is best to purchase all you need for a job in one go, rather than buying more at a later date. - We cannot exchange any Timber Product once work has commenced; Large orders and Direct Deliveries of 7" Torus Skirting are supplied as a Special Order. Haulier Delivery of 175mm Skirting Board by pallet can be arranged for larger quantities. Direct Delivery of 175mm Skirting Board may be possible from some of our suppliers. E. & O.E. see T&C - We do try to keep prices and specifi­cations of 175mm Ovolo - Torus Softwood Skirting correct, but mistakes can be made!